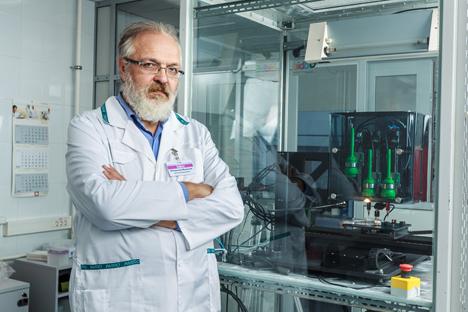 Vladimir Mironov, head of 3D Bioprinting Solutions, said his laboratory is ready to start printing a human thyroid gland after a successful experiment on mice. The next organ will be the kidney. The Moscow-based laboratory, 3D Bioprinting Solutions, announced on Dec. 17 that it has completed a unique experiment to 3D print a mouse's thyroid “organ construct.” The 3D printed thyroid gland was not rejected by the mouse's body, and is functioning. The company will soon print human organs – first a thyroid gland, and then a kidney. Exact dates have not been disclosed. Earlier this year, on March 15, 3D Bioprinting Solutions printed a mouse’s thyroid organ construct on Russia’s first bioprinter, FABION. During the experiment, which lasted several months, the printed constructs were accepted and proved their viability. That experiment’s results were first presented to the international scientific community on Nov. 8 at the International Conference on Biofabrication in Utrecht, Netherlands.